With vintage military watches getting to dam expensive I bought this parts project. I got a movement and hands and crown lined up that's a 521 movement with date and this used a 520 none date basically the same movement except one had a date wheel . But it will fit the case I could also use the 521 for parts to get one of the two none runners to working condition. Hope this in not a lost cause. But I have managed to bring a few none runners back to life. Well got hands a working movement and original crown and maybe a crystal if it fits all from one parts watch. It has a 521 movement. 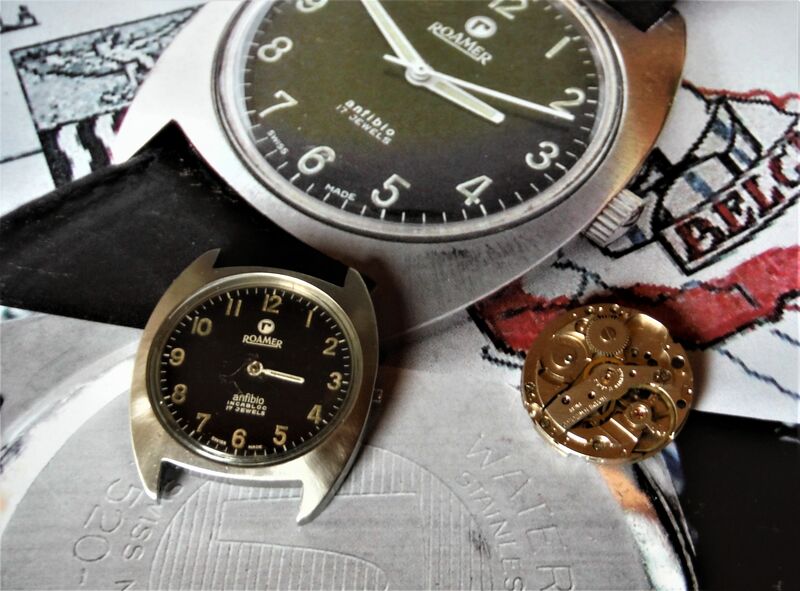 A lot of options I could maybe do the swap my self and use the 521 or have a watchmaker use parts from the 521 to get one of the 520 none date working again and the hands a close match they need to be painted white with out touching the lume. About 200 into this project all ready. Got the Roamer parts watch cheap had make offer. More info about this issued watch. 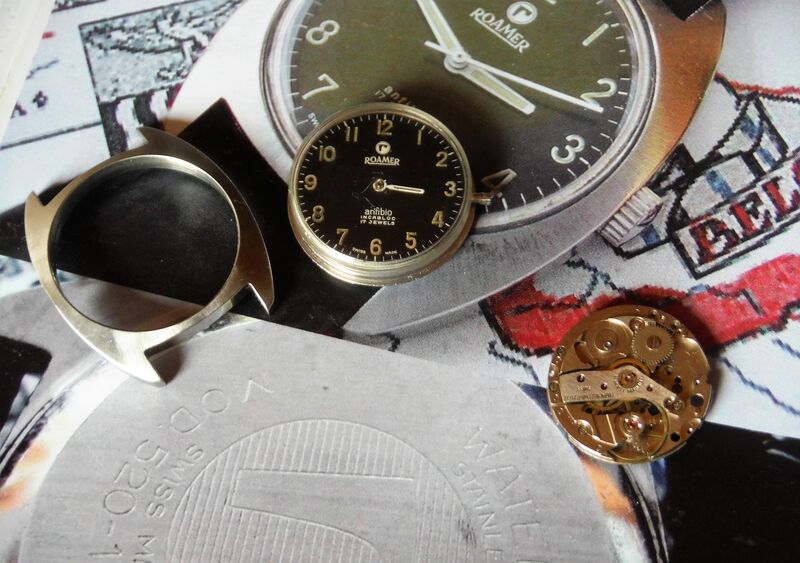 Well ordered a spare roamer crown and a plexi crystal I was told mite work from Cousins watch parts in the UK. 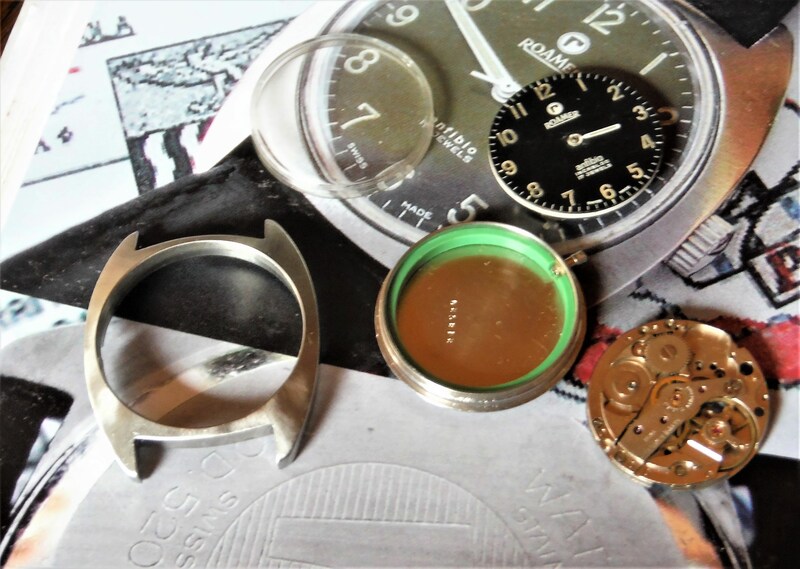 The crown uses a split stem with the female part in the crown and the male part stem in the movement sort of like the Benrus type I & II class A US issued dive watch use a two part spilt stem like this. Just trying to get all possible parts to make it easy. What I am thinking is using the 521 movement and hands from the Roamer searock I do got a male stem and male crown since it's a split stem set-up and a crystal that mite work and paint the hands white and do it my self. 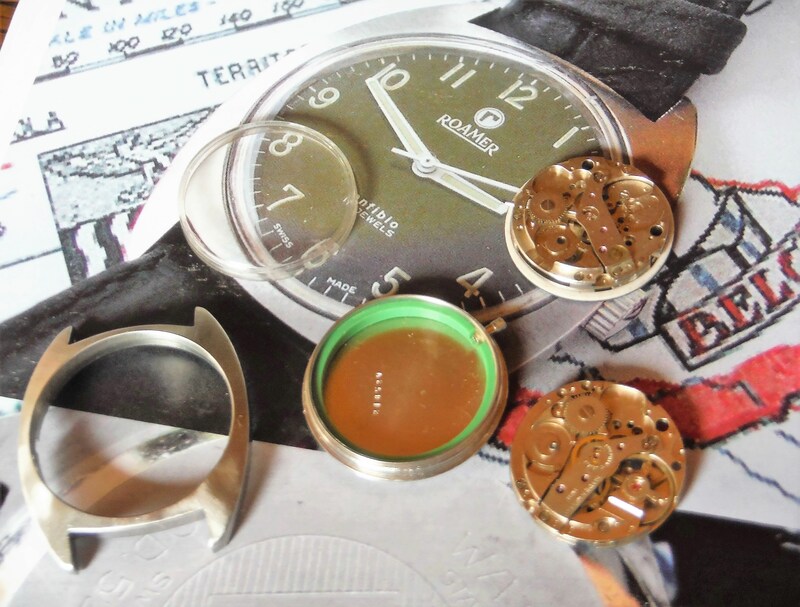 I do got a old wristwatch I can practice on removing dial and hands on. I do got a hand puller and just ordered a hand setter that has a plastic tip with hole for pushing the hands on. If I had a watchmaker rebuild the movement and use parts from the working 521 movement it would coast more than the watch is worth. So just swapping a working 521 movement and painting the hands would be cheaper way to go. The only difference between the 520 and 521 the 521 has a date with the dial no one see's the date basically the same movement. The crystal has a small crack along the edge but it mite be usable if the spare I ordered does not fit right not your normal crystal. Does have a male stem in one of the spare 520 movements. 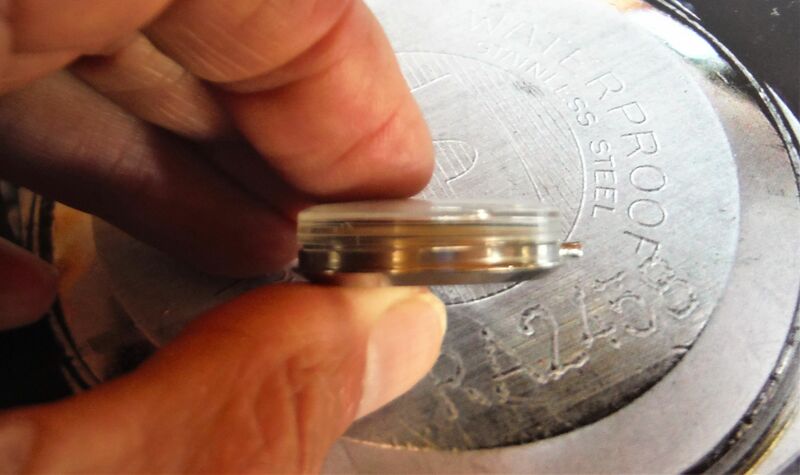 The easy way would be to use the working 521 date movement and use the hands from the donor watch and with the new crown I got ordered. The crystal do have a center logo like Omega on the crystal. Well I finely got all the parts for the rebuild. Was having problems removing the crown from the donor movement. Really did not want to ruin the donor movement and it did need regulation for the time so I sent it off to Jack at IWW to swap out the movement and regulate it and paint the donor hands white and I supplied a original Roamer crown and split stem and a new crystal I know he is busy should see it in a few months who knows maybe sooner. But it will be done right and he mite save the lume on the hands if not that's OK.
Well Jack at IWW has it now. Did send him a Email to make sure every thing I sent him was enough to put it back together never got a reply back. He is busy with work so it's the waiting game with no time line now I guess.